Jason Fried and David Heinermeier Hansson wrote about their recipe of running 37signals. They explain what differentiates them from a lot of other software companies and why only profit matters. Stay simple: Not just their product is affected by this paradigm, they try to keep their organization simple and even their books. A major problem of later-stage products, like Excel, is that they are so big and bloated. Be real: You probably know these our values pages of corporate websites. Often, they are utterly long and sadly only a few read them and even less people work by these standards. The simple solution is don’t talk. Act! Hire for real work: So you need a PhD in Physics from the best three universities who works 18h a day? Really? At 37signals they don’t care about your educational background. Can you do the job? Yes? Shows us. If you will succeed, you will be hired. Stay simple, don’t hire somebody just because she is too good not to be hired. 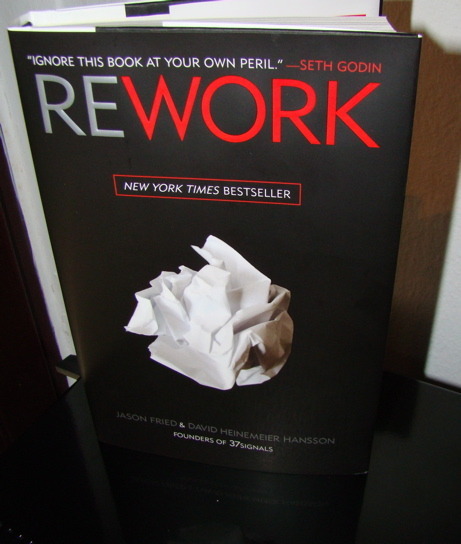 I loved this book because I’m not a big friend of high critical mass startups, i.e. “we just need 500mio users to get profitable!”. This book is down to earth, upright and refreshing. As hard as it be, we probably don’t get one million customers, we probably won’t get $250m in founding and there will be no exit with $10bn. Rework is for people who realize this but aren’t discouraged. Recommendation.